Ryanair has closed its holiday division two years after promising to shake up the market with its launch. 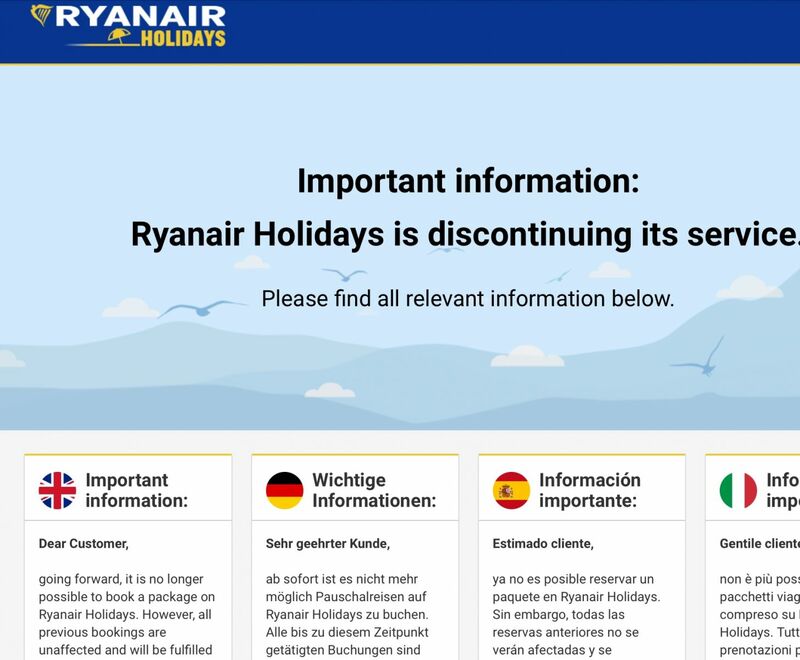 A statement on its website says: "Ryanair Holidays is discontinuing its service." It adds: "Going forward, it is no longer possible to book a package on Ryanair Holidays. However, all previous bookings are unaffected and will be fulfilled as planned." The holidays division has had a tricky time since it was launched in December 2016, when it promised to transform the market, saying people had been paying too much for their holidays. At the time, marketing chief Kenny Jacobs said: "Ryanair's low fares transformed air travel in Europe and now we're going to transform the package holiday market…offering our customers the unbeatable combination of Ryanair's low fares, a wide range of accommodation options and transfers - all on the Ryanair.com website and all at the lowest prices." In February 2017, the package holiday division was suspended when it accused its software provider Logitravel of 'illegal screenscraping'. Logitravel denied the accusation, but the partnership was ended. Ryanair Holidays went back on sale the following month after the airline signed a deal with a new software provider, German company HLX Touristik. Ryanair declined to add further comment. Ryanair probably thought tour operating was easy and they could just 'take over.' They are probably realising that it can be a tough sector to work in, never mind conquer and decided to just stick to what they know, without admitting to failure.